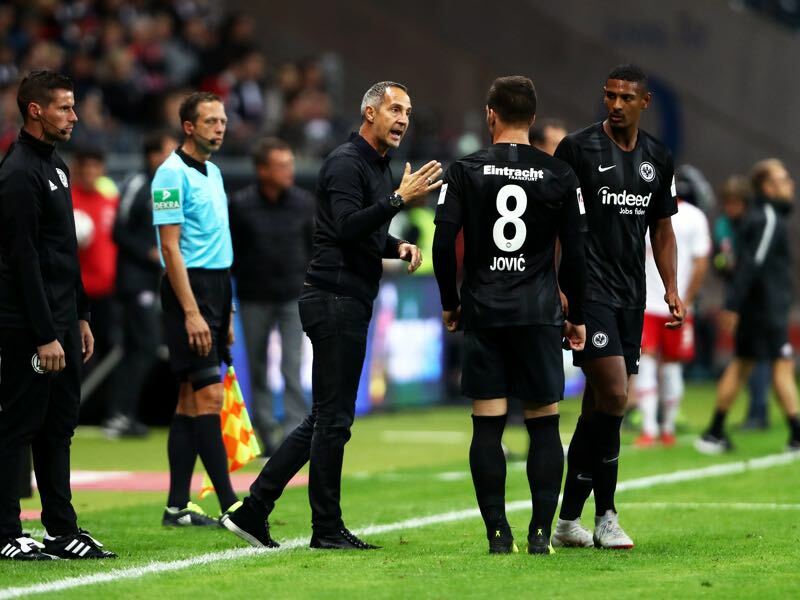 Frankfurt am Main – Eintracht Frankfurt v RB Leipzig ended in a 1-1 at the Commerzbank-Arena to round up Matchday 4 in the Bundesliga. Gelson Fernandes pounced to put Frankfurt ahead as the home side dominated the first half, Leipzig bouncing back after the break with Emil Forsberg’s penalty settling the score. Both clubs will take a point after their Europa League exertions and look ahead to Matchday 5 on Wednesday. It’s an overused cliché but one that fits the description as Leipzig battled back after looking sluggish in the first half. Frankfurt kept Leipzig on the back foot for much of the first half with Luka Jovic and Sebastien Haller proving a handful up front. Fernandes scored the opener and Jovic had a glorious opportunity to extend the lead minutes later with clear-cut chances few and far between. Leipzig came out from the break with intent and duly equalised from the penalty spot after a handball in the box. Timo Werner had two great chances to add to Forsberg’s spot-kick but fired wide, first with a deft flick from a cross and second after a goalmouth scramble. Adi Hütter started with Luka Jović and Sebastien Haller up front for the first time since the 2-1 defeat at Ulm in the DFB-Pokal 1st round. The tandem worked well with Mijat Gaćinović roaming behind which kept Leipzig on the back foot for much of the match. Luka Jović raced clear of Konrad Laimer with his cross finding Haller in the build-up to the opening goal. The Serbian striker should have doubled the lead minutes later as he raced clear but couldn’t beat Péter Gulácsi. Jović is deceptively quick but also possesses upper body strength while Haller has tremendous control for a big man. With Haller and Jović on the pitch, it means the opposition have to deal with a range of problems which keeps them on the back foot. There was also a change at the back with David Abraham, Makoto Hasebe and Evan Ndicka making up a back three with Danny da Costa and Filip Kostić the wing-backs. Kostić, in particular, enjoyed a lot of empty space and was involved in a number of promising attacks. It wasn’t Timo Werner’s day but it wasn’t for a lack of trying. The 22-year-old looked lively early on, playing on the shoulder of the defence and trying to take advantage of the inexperienced Evan Ndicka. Werner found space in the channels and scored from an offside position before heading Laimer’s cross over the bar. I’m still struggling to understand why Werner spends so much time on the touchline when he is running behind defences and getting the ball close to goal he is such a danger. 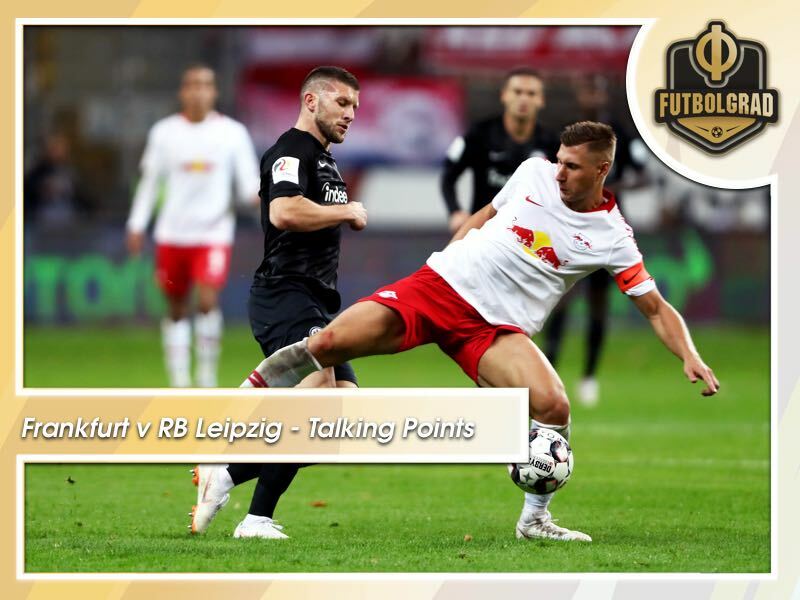 Werner had two good chances to put Leipzig ahead after they equalised and looked to go down rather easily on a late fast break, but overall he was unlucky not to score and is not far from getting back to his best. Ante Rebić has rapidly become a cult figure in Frankfurt after a strong finish last season which culminated in a decisive performance in the DFB-Pokal triumph. The Croatian then played a prominent role in taking his nation to the World Cup final. He hasn’t been seen since coming off the bench against Bayern Munich in the DFL Supercup, battling his way back from an adductor problem but received a hero’s welcome as he replaced Jovic in the 69thminute. Taking up a position up front alongside Haller, he was understandably eager to get involved and was desperately close to the winner in the closing minutes. Kostic raced clear and flashed a low cross which found Rebić yards out, Gulácsi providing a great save to preserve a point for Leipzig.